VIP people are difficult to get a meeting with. So, how do you get to arrange a meeting with them? One may follow the stalking approach which Christine Comaford supports that worked for her every time. However, at the end of her post, she felt she had to ask for apology from the person she met (in her case Steve Jobs). Why? Because stalking just doesn’t feel right. And when you approach people in such ways, the problematic nature of this approach usually sticks around for quite a long time, even if the two parties grow a business or friendly relationship afterwards. There are numerous alternative ways to approach someone famous; simple and innovative ways mostly work. If you are an entrepreneur, you should know that Mark Suster is a VIP in this ecosystem. Here is what we did do get to meet him. Our technique was inspired by Alec Brownstein, who placed an Ad while he was looking for a new job. If you don’t have the time to go through the above post, here is a short video that explains what this guy did. Great! Everything is going according to plan. Wow! 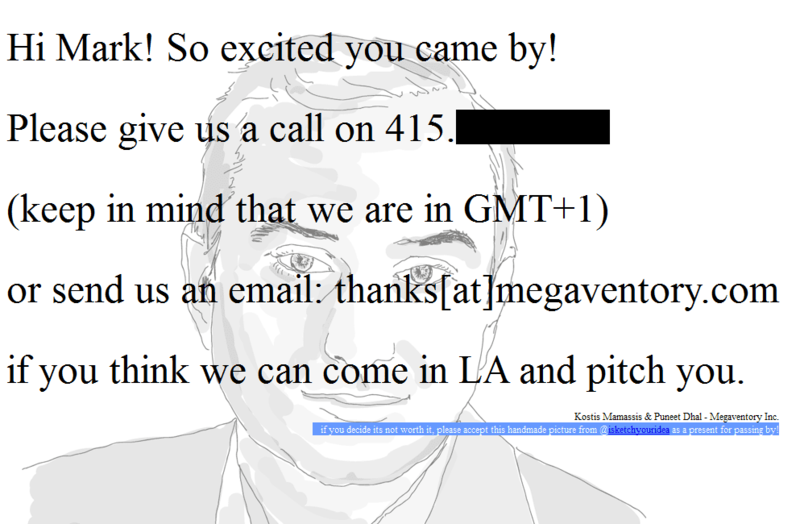 Mark Suster was actually looking for us in the internet. He visited our website and made the step to connect to us. We replied back and at the same day we set up a later meeting in his offices in LA. The reason he searched for us after almost 3 months is that our approach towards him made a very positive impression. One that I doubt you could have with the stalking approach. I am not suggesting you should copy the same approach nor that you shouldn’t do so. This post is about expressing innovation in the approach procedure just as you express innovation with your startup. It is an example of thinking out-of-the-box (again, the original idea is not ours but Alec Brownstein’s) to get from point A to B. Why do you need ERP for you business? Check out our new Megaventory.com promo video!